I just wanted to say first that I have the best readers! Y'all are seriously so sweet and I love your comments:) So thank you so much for reading and I love hearing from y'all!! I found this skirt at Target awhile ago and I totally love it! I think its such a fun color and its LACE!! Lace is one of those trends this season that I love, I think its so feminine and girly. But this color is so fun because I can wear it with so many other colors! I thought that this bright teal shirt looked really good with the skirt because it just popped. 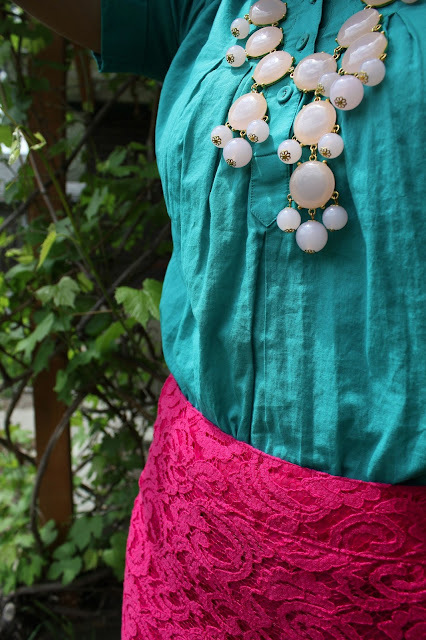 This skirt is one of my favorites because its lace and bright, two things I love to wear this season. love the lace! super cute! love the fuchsia and teal! What a cute skirt!! Love you outfit - you're so gorgeous!! I LOVE that skirt!! I'm studying abroad in New Zealand right now, and the number one thing I miss (besides my pups!) is Target! It will most likely be my first stop when I get back home haha. I love the bright colors! The magenta skirt is to die for! shoot! I recently sold this skirt to rag o rama, now I want it back! That skirt is so gorgeous! Such a great color combo too! You look so cute! In love with that pink skirt!! you look gorg! I need this skirt, it's so cute!! Also you look gorg, as usual! !